This is an easy lasagna casserole recipe (or baked rotini as it’s also called) that’s as simple as it is delicious. 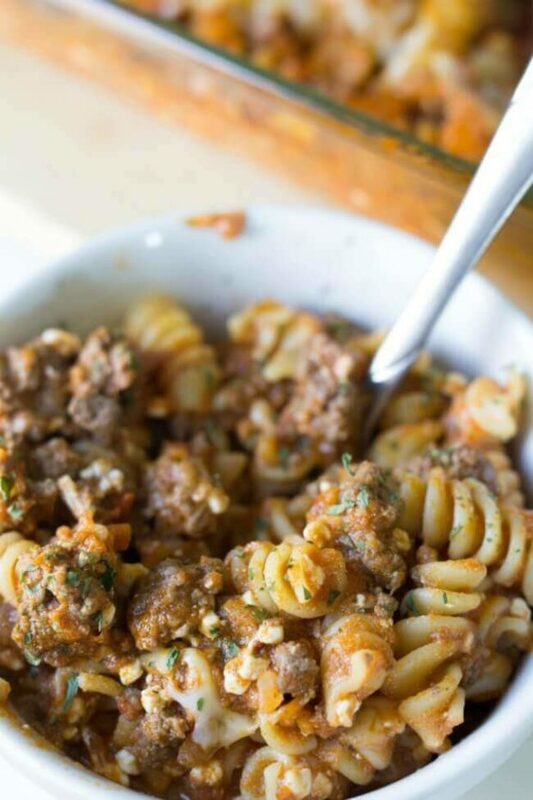 This recipe combines tender pasta, zesty spices, hearty ground beef, tomato sauce and plenty of cheese. Simple and hearty and delicious, it is a family favorite dinner at our house. It’s so easy and quick to prepare as well. If you happen to have leftovers, those heat up for an incredible meal the next day, too! You can’t go wrong with this amazing lasagna casserole – I know you’ll love it. But if you’re looking for delicious pasta dishes, you should also try this baked ziti recipe and this cheesy baked spaghetti. And don’t forget the dinner rolls on the side! Who likes simple meals that are easy to fix? Both hands up here! 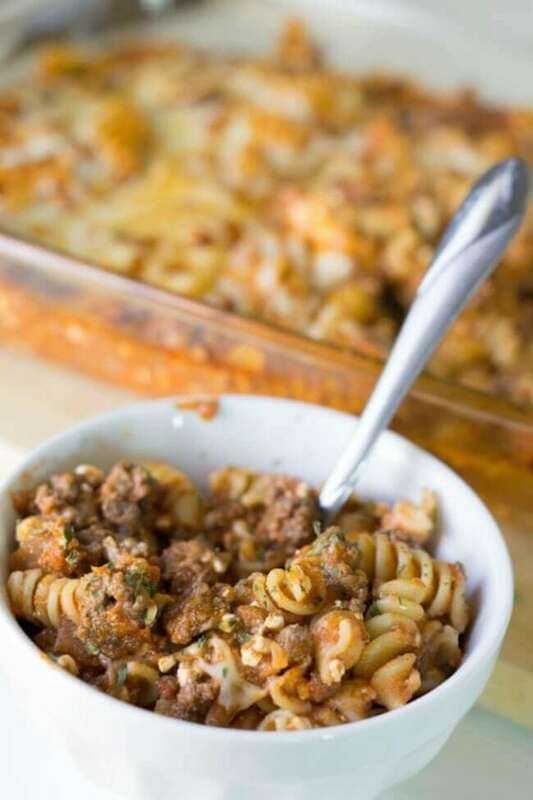 An easy lasagna casserole is popular at our house and this lazy lasagna casserole with rotini noodles (or it can be made with shells), ground beef, cottage cheese, pasta sauce and a top of mozzarella cheese is heavenly comfort food. Three boys, work, school, sports, and extracurricular activities keep me hopping. And don’t even get me started on keeping the house in order, endless piles of laundry, and the male species’ need to constantly eat. That’s why I’m thankful my boys like pasta dishes. They’re versatile, easy to cook, and economical. 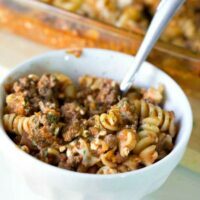 A baked rotini dish is always welcome on our table but I don’t want my guys to burn out on a favorite so I add a bit of variety by switching out sauce flavors, playing with spices, and swapping out cheeses. You can even sneak in a few vegetables and change the type of meat or omit it entirely. You can take this mixed up lasagna in a different direction by using an alfredo sauce instead of the more traditional tomato sauce, too. When I do that, I like to use chicken instead of beef. And if you want a south-of-the-border flavor, add taco seasoning, substitute Colby cheese for the mozzarella, and top it with shredded lettuce and sour cream. All of my boys love cheese and according to their taste buds, I can never add too much. According to this cook, you can go overboard on the mozzarella because too much of a good thing makes the dish too gooey. To add a bit of flavor diversity, sometimes I use ricotta and Parmesan cheeses and even crumbled feta. In some incarnations, I add Romano, Gruyere, and cheddar. Spice-y additions include extra garlic, basil, fennel, oregano, Italian seasoning, dried onion, and parsley. In the mom-wants-you-to-eat-more-veggies category, spinach, parsley, olives, zucchini, eggplant, mushrooms, tomatoes, and bell peppers have been met with different levels of satisfaction at our house. The trick seems to be to add only an amount of veggies that will not overpower the tomato-cheese flavor. And a word on the pasta: We really like the rotini noodles but certainly shells, bowties, elbows and all manner of pasta shapes work in this recipe. You can even forgo the entire pasta additions and use spaghetti squash for a similar taste. As far as meat substitutes, Italian sausage is very popular around here, but I have experimented with chicken, pepperoni, and leftover BBQ pork. You can also toss in canned red beans for another take. FYI, instead of using only mozzarella cheese, a mozzarella and cheddar mix goes even better with the BBQ pork. Are you getting the idea that there’s more to this easy recipe than you might have initially thought? How to freeze this casserole? 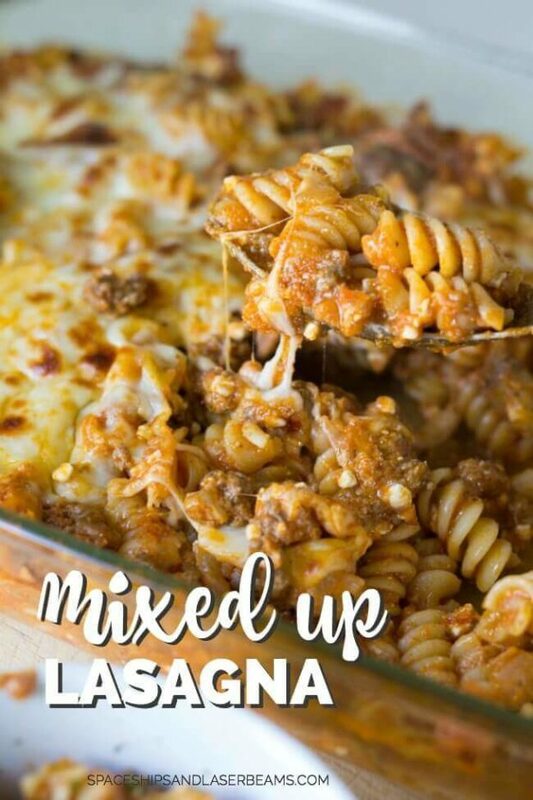 Adding to the diversity of this easy lasagna casserole, you can make a double batch and freeze half for future meals. Make sure it is wrapped very tight with aluminum foil and/or a freezer bag. Just remember it’s best to pull it out of the freezer and let it thaw in the fridge. You can do that the morning you want to use it for dinner, but it’s even better if it thaws for a couple of days. That’s because the center of the lasagna often remains frozen and then it is a little mushy. If you do thaw and eat it the same day, add extra baking time and check to be sure you’re not burning the edges, says the voice of experience who rarely remembers to thaw it for two days. What to serve with lasagna casserole? I usually add a fresh, salad — try my easy caesar salad recipe — or cut-up veggie sticks, my simple sauteed vegetables, and warm, crusty bread to fill out the meal for my boys’ always hungry tummies. Pair it with cornbread, beer bread or cheese biscuits! Feeling adventurous? Use this delicious homemade pasta sauce recipe. AN EASY LASAGNA CASSEROLE RECIPE (OR BAKED ROTINI AS IT’S ALSO CALLED) THAT’S AS SIMPLE AS IT IS DELICIOUS. Fry hamburger with diced onion; add salt and pepper to taste. Boil rotini al dente, according to package directions. Add cottage cheese to hamburger/onion mix. Pour pasta sauce over mix. Scoop mixture into greased 10 x 15 casserole dish. Bake at 350 for about 15 minutes, or until cheese is bubbly. This recipe was so easy and so delicious! Thank you for this Easy Lasagna Casserole Recipe! I love the taste! My family liked this recipe. Very easy and quick to make. Have made this several times- even better as leftovers! Can you use something else instead of the cottage cheese? I use ricotta cheese. Very good as well. My family won’t eat cottage cheese, so used cream cheese instead… once the hamburger is done, just cut the cream cheese into cubes and add to hamburger and stir until creamy, and add a ladle of pasta water to mixture. I know it kind of changed the recipe up, but followed the rest of the recipe, and it was still good! This was a hit with my boys! Easy to make and easy clean up! So delicious! Thank you!